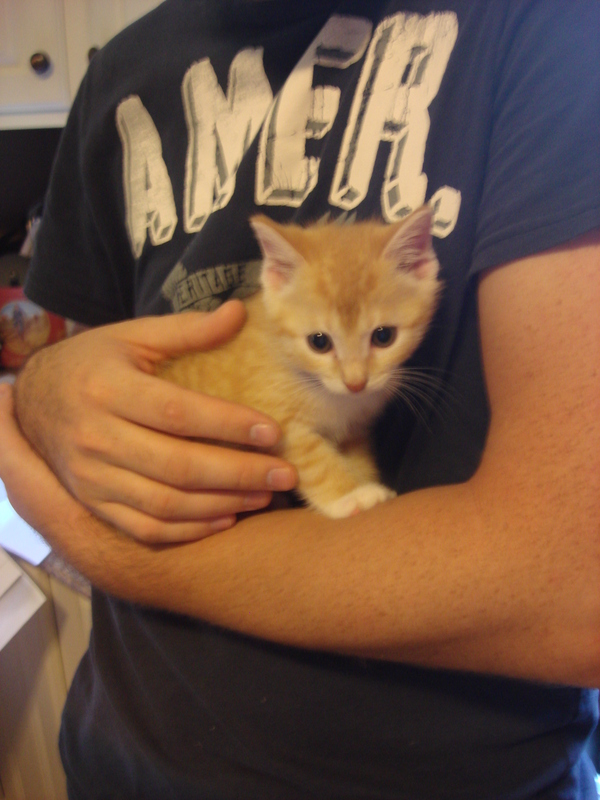 Darren and I went to Maine this weekend and came home with a little baby kitten. I’m not an animal person. I’m also not a committment person. I like being able to pick up and take off whenever I want to <————————– and that is the number one reason why I don’t have kids. True story. Anyway, if I’m not an animal person, I’m really not a cat person. I would much rather have a big fluffy German Shepherd or a cuddly little Chocolate Lab. 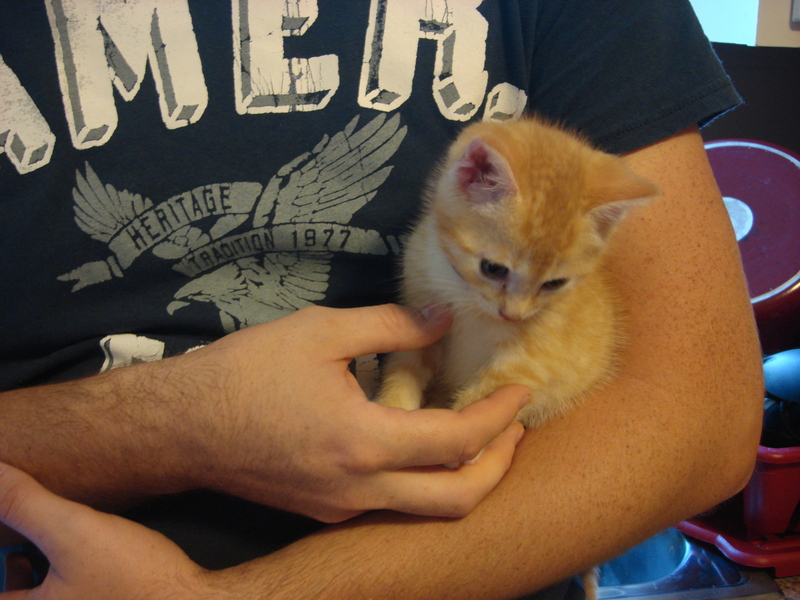 But as it turns out, Darren and I are both softies and this particular little kitten had a sob story. Mamma cat had too many baby cats and by the time this baby cat got here, mamma cat was done feeding and taking care of kittens. This kitten was the only one of her litter to survive and was starving. 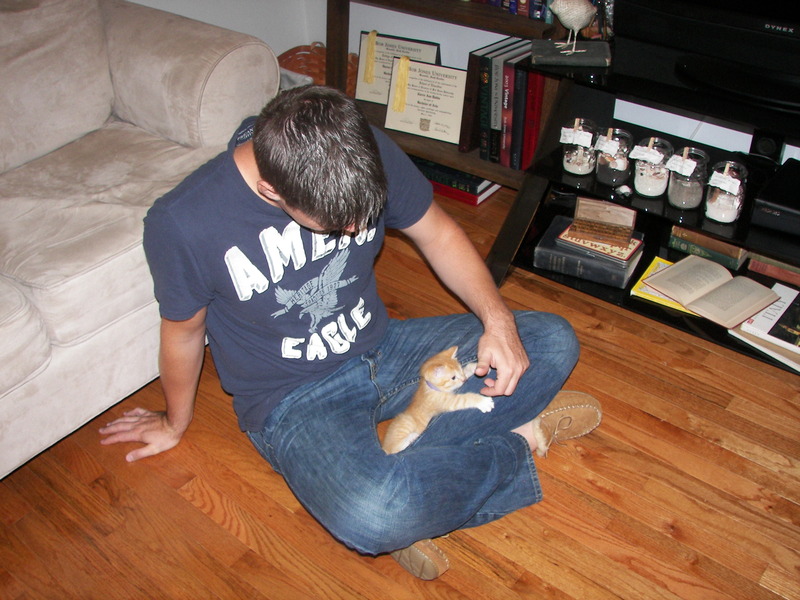 Darren’s aunt and uncle starting feeding the kitten and taking care of her but they needed to find a permanent home. We listened to the above sob story and took the bait like the suckers that we are. Darren wanted to name her Cleopatra. He wants to name everything Cleopatra. It kind of creeps me out. If Cleopatra didn’t die a thousand years ago, I might even be jealous. I wanted to name her Poppy. I want to name everything Poppy including one of our children. Darren won’t let me. Sigh. So, here is little miss sob story Katniss—orange and white stripped trouble maker that she is. This entry was posted in Home + Garden and tagged Adventures, Animals, Life, Pets, Various & Sundry. Bookmark the permalink. Cleopatra… have you looked in a mirror? I called you that when I first saw you. And he gets to live with Cleopatra, with a Dunkin Donuts fixation to boot… what’s not to like. Cute kitty… much easier than a dog. I might look like Cleo with the eye makeup but I look like a 12 year old boy without it. He might not be as lucky as you think :] I do love that little kitty though. This is a touching story. I do hope that you learn to love and appreciate this new addition to your life. I have had similar experience that turned out quite well. We love her so much already. I’m so glad we got her! Very sweet. Looks like she is comfortable and enjoying her forever home. Great post. What a great post! Just out of curiosity, what’s with the name poppy? I know I should be asking the same with the name Cleopatra but poppy had me more interested. Haha. 🙂 My boyfriend and I actually took in a baby kitten from outside. She’s all black with yellow, orange eyes so we named her Elvira. Poppies are my favorite flower and I just think it’s cute for a name…really no better reason than that :] Elvira is an adorable name too! Awe! Thanks! 🙂 Good luck with your new family addition! Oh my goodness! That could be Ashley’s sister. Ashley being my cat from 15 years ago. A brilliant piece of work. All the mischief and independence of a cat but responded to my commands like a dog. Had her for many fun years until…she went missing. A sad day it was. Enjoy the new family member. Maya, you guys are welcome to come over any time to see her. Maybe we could do dinner one night this week and then the boys could play with her. We are in love. She is so cute and funny. I’m so glad we finally decided to get her! She did steal our hearts for sure! I wasn’t a cat person either, and now I definitely am 🙂 Congrats on the kitty! You make me laugh Grams :] You’re right, there never will be another Pokey…I miss him snuggling up with me and laying his head on my lap. Thanks! We love her already!